The lead-up to presidential impeachment is worse for markets than the actual process, at least judging by what happened last time around. Rumblings of impeachment have begun to creep up across America and on Capitol Hill amid reports President Trump may have asked since-ousted FBI Director James Comey to drop an investigation into fired National Security Adviser Michael Flynn. While most senior Democrats say it is too soon to realistically discuss the possibility of impeaching Trump, investors are clearly unsettled. The good news: during Bill Clinton's impeachment process in 1998-99, stock markets did fairly well. The bad news: the current scenario is not exactly the same. The Clinton administration was plagued by a series of scandals in the 1990s, culminating in the president's impeachment by the House of Representatives in December 1998 on charges of perjury and obstruction of justice related to his extramarital affair with former White House intern Monica Lewinsky. The House had voted to initiate proceedings in October of that year in the wake of a report by independent counsel Kenneth Starr detailing Clinton's misdeeds. Following the impeachment, the Senate acquitted Clinton in February 1999. Market reaction to the Clinton scandal was perhaps in retrospect surprising. While stocks fell ahead of the release of the Starr report, they climbed thereafter and through the conclusion of the impeachment proceedings. 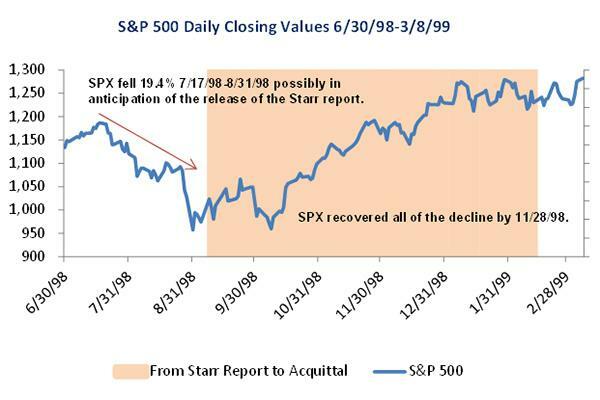 The S&P 500 climbed slightly from July 1 to July 17 of 1998, but from there until the release of the Starr report on September 9, it fell by 19.4%, according to data from CFRA Research. After that, however, it rallied, recovering the entire decline by November 28, 1998, while impeachment proceedings were still underway but a month before a conclusion was reached. "The Starr Report didn't have anything new that people weren't aware of already, so the market felt comfortable to move up again," said Seth Kaplowitz, a San Diego-based attorney and finance lecturer. From when the House voted to start impeachment proceedings on October 8, 1998 to the Senate's acquittal on February 12, 1999, the S&P climbed from about 960 to 1230, a 28% gain. The scandal brewing around the Trump administration at the current moment, however, does not exactly mirror Clinton, warned Princeton University historian and CNN political analyst Julian Zelizer. "This was after years of investigating President Clinton on all kinds of issues," he said, noting controversies including Whitewater and Travelgate. "This was just a very long process by Republicans by claiming there was scandal in the White House." While the Clinton affair was a slow burn, things at the moment appear to be moving much faster. Take, for example, the timeline events of the past eight days. Trump fired FBI Director Comey last Tuesday. On Wednesday, he met with Russian diplomats, on Thursday, he told NBC's Lester Holt he fired Comey over the Russia investigation, and on Friday, he tweeted he has "tapes" of the pair's conversations. On Monday, reports indicated he shared highly classified intelligence in the Russia meeting. On Tuesday, it was reported that the information came from Russia. Later in the day, news of the Comey memo broke. "There's much more shock and awe right now in terms of how fast this is happening and probably the sense of uncertainty," Zelizer said. "You had been through so many scandals in the 1990s, it wasn't clear this would amount to anything as it unfolded, whereas here there is probably more to fear that this could be more serious stuff." There are other differences, too. The Clinton impeachment proceedings came after the president's reelection, when the White House had a much more coherent, professional team in place. "There was never a sense that the Clinton White House was dysfunctional," Zelizer said. "Today, people aren't even sure who is in control in the Oval Office." He also noted that Clinton had a clear partisan enemy in Congressional Republicans and then-Speaker of the House Newt Gingrich. While Trump has placed the blame for his troubles on the media and the Democrats, "that's not the heart of the story right now," Zelizer said. To be sure, Trump is not on the brink of impeachment. While some Democrats and even a select few Republicans have begun to mention the matter, action is likely a ways away -- and unlikely with the GOP in control of Congress. Washington, D.C.-based research firm Height LLC in a note on Tuesday assigned 15% odds to impeachment, resignation or some other method of removal for Trump, though they clarified that just two weeks ago they put the chances at 0%. "Such processes can take months if not years, but they can wrap up quickly once some major shoe drops," analysts Peter Cohn and Nils Tracy said. For example, Nixon resigned just weeks after the Supreme Court compelled him to provide unedited access to his Oval Office recordings. And while markets took a big hit during the Watergate scandal, there are no guarantees they would with Trump. They didn't in the Clinton impeachment, and the investors might not mind the prospect of a President Pence, who might have an easier time delivering tax reform Wall Street so desires. "Consider the fact that the drama-free Vice President Mike Pence would assume the position with strong working relationships on Capitol Hill and knowledge of the political process from his years in the House and as Indiana Governor," Cohn and Tracy said. "Having a President with more political capital to spend and higher approval ratings could mean more gets done legislatively." Editors' pick: Originally published May 17.